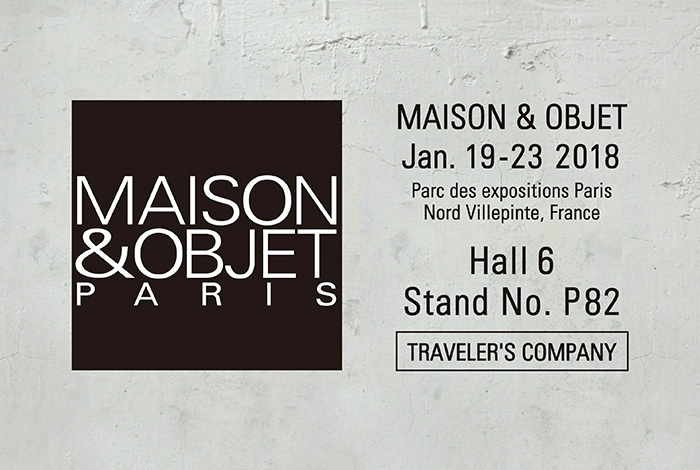 TRAVELER’S COMPANY™ will exhibit at MAISON & OBJET PARIS. TRAVELER’S COMPANY™ in MAISON & OBJET PARIS (Friday, January 19 to Tuesday, January 23, 2018, at the Parc des expositions Paris Nord Villepinte, France), a trade fair for the design and lifestyle fields that takes place twice a year. Now we plan to display our products at MAISON & OBJET PARIS, an exhibition which will be visited by buyers not just from Europe, but from all over the world, including America and Asia, in order to promote TRAVELER’S COMPANY™ worldwide as an original brand that was born out of these notebooks developed in Japan. In our booth, we will display TRAVELER’S notebook™ and other TRAVELER’S COMPANY™ products, and also show off a number of our collaboration archives, and our history since 2006. We will publish a report on the venue on the official TRAVELER’S COMPANY™ web site in the future. ・Presentations concerning our brand concept, the story of our development, and our history.